Lilacs (Syringa spp.) provide amazing flowers and fragrance in late spring to gardens in U.S. Department of Agriculture Plant Hardiness Zones 3 through 7. At some point, you may wish to relocate an established shrub, placing it in a better location, or to rejuvenate an old plant. The key to success in transplanting the lilac is protection and preservation of as many roots as possible. In "Lilacs: A Gardener's Encyclopedia," author John Fiala said there are three opportune times to dig up a lilac shrub and transplanting. The best being late midsummer--the first weeks of August. Next is late fall after the shrub's leaves have dropped and the soil is workable, but there is no frost--October or November, depending on your location. The third best time is in late winter to early spring, before the leaf buds have swollen and unfurled the lilac's first leaves. Lilacs have fibrous roots that are generally within the top 18 inches of topsoil. Retaining as much of the roots and topsoil when digging a lilac is beneficial. You can balance retention of roots and soil with the size and weight of the root ball you must physically move. If you plan to move a lilac within the next year, consider cutting the shrub's roots in increments leading up to transplanting. Approximately 1 to 3 feet away from the base of the lilac, pierce the soil straight down 12 to 18 inches. Make this soil cut on two opposite-sides of the shrub, so one-half the root system is cut. About months later, do the same around the rest of the lilac. Once the lilac is dug up on transplanting day, keep as much soil on the roots as possible. Wrap the root ball in an old blanket or tarp to drag to the new planting hole, avoid shaking off soil as you move the plant. The new planting hole must allow the plant to rest at the same depth as it previously grew. The hole should to two to three times as wide as the lilac's root ball. Adjust the depth of the planting hole until its crown is level with the top of the soil. Darker or muddy trunks and roots obviously were once underground. 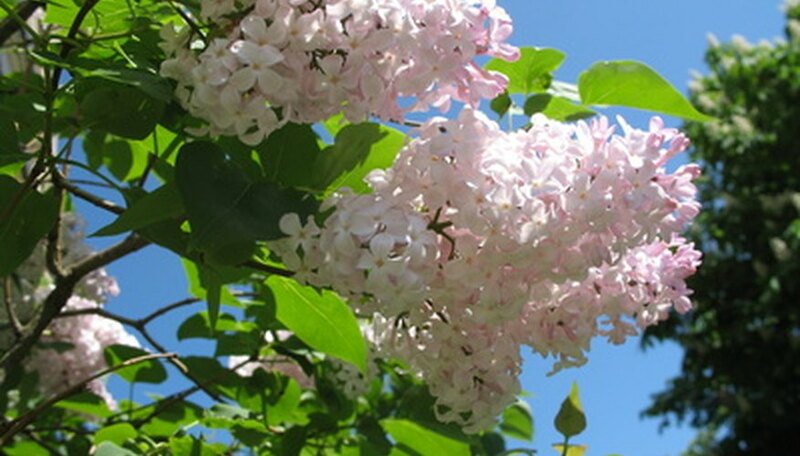 Once the lilac bush is in its new location, keep it in moist soil for 3 to 6 months. Do not make the soil soggy, but ensure that newly emerging roots are never exposed to dry conditions. Place a 2- to 4-inch layer or organic mulch around the planting area to retain soil moisture and moderate soil temperatures. Fertilize the shrub only the following spring after the transplanting, and then only when new foliage emerges. Consider staking the lilac if it is a windy location or the plant is not upright and secure in the planting hole. Remove the stakes after one growing season.